Such web sites add a considerable amount of complexity to the technical task of downloading a file. The problem usually starts with obtaining the direct URL to the PDF file. Also, HTTP redirection and cookies are usually involved. Often times, the only solution people see to solve these issues is to set up a VPN and then to use a fully fledged browser through that VPN, and let the browser deal with the complexity. However, I prefer to get back to the basics and always strive to somehow find a direct URL to the PDF file to then download it via curl or wget. The method first parses the HTML source code of the main page corresponding to the article and extracts a URL to the PDF file. At the same time, it also stores the HTTP cookie(s) set by the web server when accessing named web page. These cookies are then re-used when accessing the PDF file directly. This has reproducibly worked for me. If it does not work for you, I recommend having a look into the file pdfurl and see if that part of the process has lead to a meaningful result or not. Obviously, the second step can only succeed aver having obtained a proper URL to the PDF file. This snippet should not be treated as a black box. Please execute it in an empty directory. Also note that this snippet only works subject to the condition that ScienceDirect keeps functioning the way it does right now (which most likely is the case for the next couple of months or years). Don’t hesitate to get back to me if you have any questions! This entry was posted in Companies & Products, Linux, Science, Technology on September 12, 2015 by Jan-Philip Gehrcke. Google can display upcoming concert events in the Knowledge Graph of musical artists (as announced in March 2014). This is a great feature, and probably many people in the field of music marketing and especially record labels aim to get this kind of data into the Knowledge Graph for their artists. However, Google does not magically find this data on its own. It needs to be informed, with a special kind of data structure (in the recently standardized JSON-LD format) contained within the artist’s website. While of great interest to record labels, finding a proper technical solution to create and provide this data to Google still might be a challenge. I have prepared a web service that greatly simplifies the process of generating the required data structure. It pulls concert data from Songkick and translates them into the JSON-LD representation as required by Google. In the next section I explain the process by means of an example. This piece of data needs to be included in the HTML source code of the artist website. Google then automatically finds this data and eventually displays the concert data in the Knowledge Graph (within a couple of days). That’s it — pretty simple, right? The good thing is that this method does not require layout changes to your website. This data can literally be included in any website, right now. 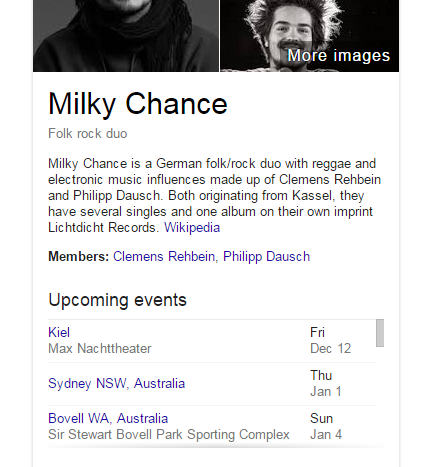 Google Knowledge Graph generated for Milky Chance. Note the upcoming events section: for this to appear, Google needs to find the event data in a special markup within the artist’s website. So, in summary, when would you want to use this web service? You have an interest in presenting the concert data of an artist in Google’s Knowledge Graph (you are record label or otherwise interested in improved marketing and user experience). You have access to the artist website or know someone who has access. The artist concert data already is present on Songkick or will be present in the future. Of course, the event data shown in the Knowledge Graph should be up to date and in sync with presentations of the same data in other places (bands usually display their concert data in many places: on Facebook, on their website, within third-party services, …). Fortunately, a lot of bands actually do manage this data in a central place (any other solution would be tedious). This central place/platform/service often is Songkick, because Songkick really made a nice job in providing people with what they need. My web service reflects recent changes made within Songkick. The core of the web service is a piece of software that translates the data provided by Songkick into the JSON-LD data as required and specified by Google. The Songkick data is retrieved via Songkick’s JSON API (I applied for and got a Songkick API key). Large parts of this software deal with the unfortunate business of data format translation while handling certain edge cases. The web service enforces transport encryption (HTTPS). Songkick back-end is queried via HTTPS only. Songkick back-end is queried concurrently whenever possible. Songkick responses are cached for several hours in order to reduce load on their service. Responses of this web service are cached for several hours. These are served within milliseconds. Incoming request, specifying Songkick artist ID, artist name, and artist website. Using the Songkick API (SKA), all upcoming events are queried for this artist (one or more SKA requests, depending on number of events). For each event, the venue ID is extracted, if possible. All venues are queried for further details (this implicates as many SKA requests as venue IDs extracted). All event representations are combined and a returned. An example artist with 54 upcoming events requires 2 upcoming events API requests (two pages, cannot be requested concurrently) and requires roundabout 50 venue API requests (can be requested concurrently). Summed up, this implicates that my web service cannot respond earlier than three SKA round trip times take. If none of the SKA responses has been cached before, the retrieval of about 2 + 50 SKA responses might easily take about 2 seconds. This web services cannot be faster than SK delivers. This web service applies graceful degradation when extracting data from Songkick (many special cases are handled, which is especially relevant for the venue address). It contains a web form where you can enter the (currently) three input parameters required for using the service. It returns a service URL for you. This URL points to my application hosted on Google App Engine. Using this URL, the service returns the JSON data that is to be included in an artist’s website. That’s all, it’s really pretty simple. So, please go ahead and use this tool. I’d love to retrieve some feedback. Closely look at the data it returns, and keep your eyes open for subtle bugs. If you see something weird, report it, please. I am very open for suggestions, and also interested in your questions regarding future plans, release cycle etc. Also, if you need support for (dynamically) including this kind of data in your artist’s website, feel free to contact me. This entry was posted in Companies & Products, Google App Engine, Music, Python, Software architecture, Technology, Web development, Web Services on December 12, 2014 by Jan-Philip Gehrcke. You should let ‘SamKnows’ know. Volunteers will receive a purpose-built broadband measurement unit which can be plugged into the existing modem/router. This is called the SamKnows Whitebox. The network device periodically performs measurements without interfering with actual payload traffic in your network. It monitors Ethernet as well as wireless LAN. The data becomes uploaded, aggregated, and nicely visualized in a personalized dashboard. If you are paranoid, you probably do not want to have such a device in your home and you might argue that you can measure for yourself. However, I think that this project is trust-able and the statistics obtained by SamKnows are essential for evaluating and developing broadband Internet access in Europe. Furthermore, the data obtained by my Whitebox were already multiple times useful for convincing my ISP that it is not holding up its end of the contract. This entry was posted in Companies & Products, General, Technology on July 18, 2014 by Jan-Philip Gehrcke.